Merlin is back with even more magic, adventure and romance as the young wizard struggles to protect Prince Arthur in the perilous world of Camelot. While battling deadly assassins, mystical monsters and the most powerful sorcerers Camelot has ever seen, Merlin must work harder than ever to conceal his unique abilities, as King Uther redoubles his war against magic. And Merlin isn’t the only one whose destiny calls—Lady Morgana , Uther’s ward, discovers dangerous secrets she dare not reveal; Lancelot returns, changing everything for both Gwen and Arthur; and King Uther fall in love, little knowing that the charming Lady Catrina is secretly a hideous troll. And as Arthur continues on his path from arrogant prince to the noble and just King Arthur of legend, we see the return of the one prophesised to kill him—the mysterious druid boy, Mordred. Featuring exciting new villains, white-knuckle stunt sequences, and spectacular CGI monsters, Merlin Season Two is more thrilling than ever. Unlike their flawed and somewhat misguided approach to Robin Hood, this BBC reimagining of the Arthurian legend through the eyes of the adolescent wizard, Merlin, is not only ridiculously entertaining, but also successfully takes a classic story and makes it feel fresh and unpredictable. The second season is even stronger than the first, with stronger writing, performances directing and slightly better effects. With the focus on the young wizard Merlin and his friendship with the future King Arthur, the second season continues to establish the groundwork for the legend and also delves into both the relationships of Merlin and his mentor Gaius and Arthur and his father King Uther. Although on paper it might seems as if Merlin is nothing more than a Smallville take on Camelot, the series is darker and more clever. Although we know which direction the story is headed in, the roads to get there are quite different. Destiny tends to play a large part and this series is no exception, introducing characters and rewriting relationships including those between Arthur, Merlin, Guinevere, Morgana, Mordred, Lancelot. The backstory is equally fascinating with Merlin serving as Arthur’s personal servant, blessed with magical powers and unable to use them in public, since King Uther has outlawed magic in Camelot. Morgana is Uther’s ward (and also has developing powers) with Arthur’s Guinevere serving as her handmaiden. And of course, Lanceleot shows up to complicate things. Also new to the legend is The Great Dragon (voiced by John Hurt), who is chained in an underground cavern beneath the castle and offers advice to the young sorcerer. And despite the limitations with the quality of the CGI and sharp humor, the series never devolves to the level of Hercules or Xena. Terrific performances from the cast overall, and it’s always fun to see Buffy‘s Anthony Head (who plays King Uther) If you’re willing to go along with the journey, it’s hard to be disappointed. The season ends with a satisfactory conclusion, but definitely sets up intriguing plot points of what’s to come. Extras include introductions to each episode, commentaries, featurettes, downloadable wallpapers, and a photo gallery. 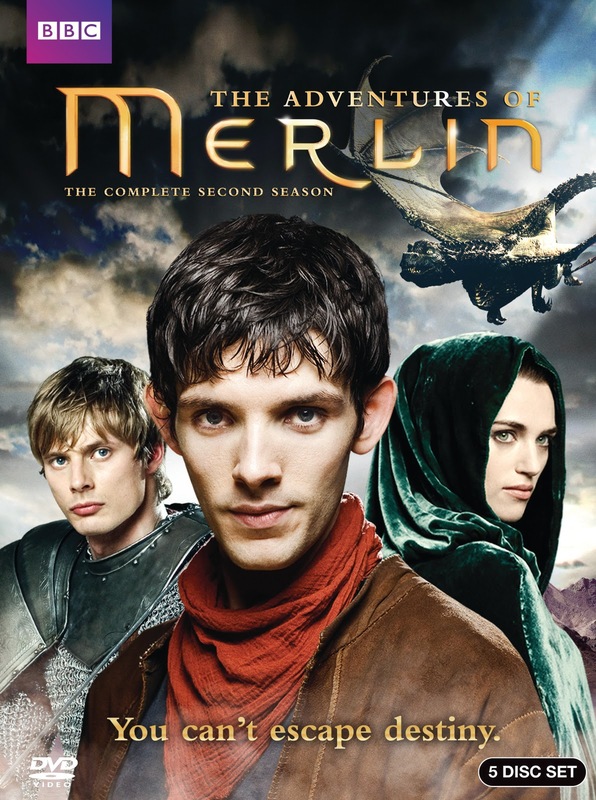 Merlin: The Complete Second Season is another well crafted series from the BBC that’s not only incredibly engaging, but also tremendously entertaining for viewers of all ages. Highly recommended.